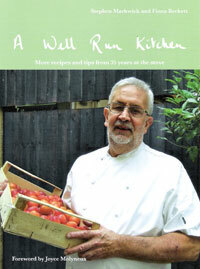 WE HAVE NOW SOLD THE RESTAURANT & RETIRED BUT ARE STILL SELLING OUR 2ND BOOK,(SEE BELOW). We are happy to discuss the possibility of cooking some dishes for you to eat at home. Please email markwicks@culinariabristol.co.uk or ring us on 0117 9421970. The second volume of Stephen’s culinary memoir focuses on lessons he learnt from the late, great George Perry-Smith and his mentor Joyce Molyneux who wrote the foreword to this book. There are another 20+ well-loved recipes including Cucumber Fritters, Twice-baked Cheese Soufflés and Salmon in Pastry. 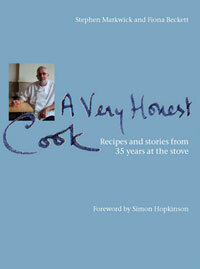 "Everyone can cook them (the recipes) & they result in much admiration & much happiness - you can't ask for more"
Stephen's first book, with the foreword by Simon Hopkinson, tells the story of his three Bristol restaurants and his 35 year career at the stove. It includes over 20 customers' and Stephen's favourite recipes including Provençal Fish Soup, Boeuf Bourguignon and St. Emilion au Chocolat.